Chendamangalam Synagogue is a 17th century traditional style Jewish Synagogue Paravoor Taluk of Ernakulam District . 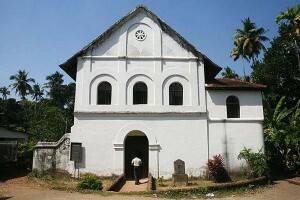 It is a Muziris Heritage site at the center of the quiet village . The Synagogue has been renovated many times with traditional Kerala Style architecture with some limited surface details inspired by the Portuguese colonial period such as fan-like alettes or native painted panels, local timber roof framing covered in clay tiles with deep overhangs, and large windows and doors deeply revealed into the thick walls. There is a cemetery of about 400 meters long belonging to this Synagogue on the east side of the Synagogue, and also there is a tomb inscription in front of the Synagogue which is believed to be one of the early members of the Synagogue.